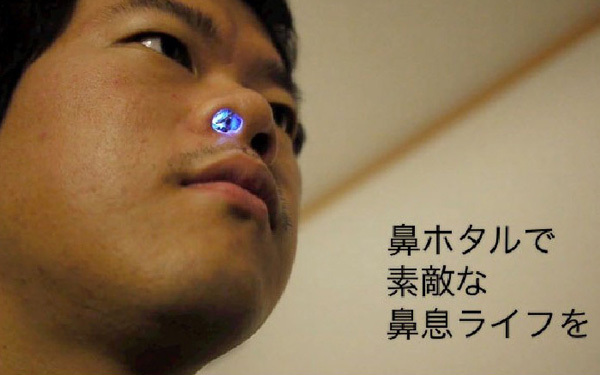 This nose LED is definitely a bold way to show your geek attitude! Imagine your nostril glows every time you exhale. Weird but fun? Then buy one to surprise your friends! High ambient temperature could affect the precision of Nose LED Kit. if your ambient temperature happens to be around 32°C or higher, this Normally On Version is designed for you. Try its better experience! Keep children away to prevent them from accidentally swallowing tiny batteries. Breathe softly when the Nose Kit is inside your nose. Otherwise it might get stuck in your nostril. Don’t use it among crowds to avoid unexpected injuries. To secure the Nose Kit, double-faced adhesive tape is recommended. To remove the Nose Kit, tweezers is recommended.